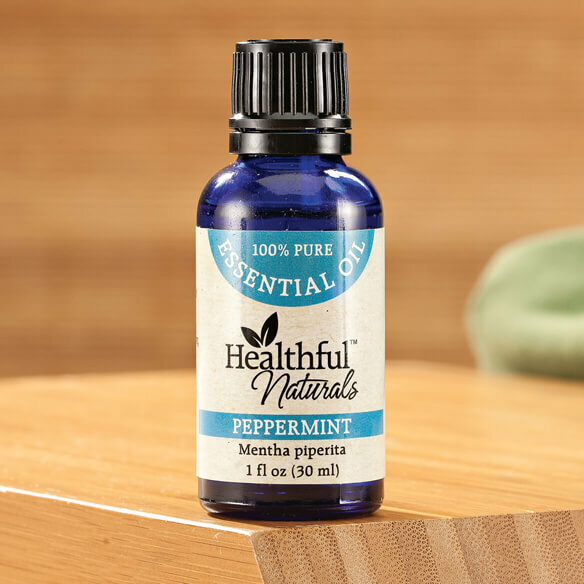 Soothe an upset stomach and other aches and pains with Healthful™ Naturals peppermint essential oil. Steam-distilled from the flowering herb, it has an energizing menthol aroma with sweet undertones. This natural antispasmodic often is used to help relieve nausea, soothe muscle aches and migraines, and promote clear respiratory function. Always use essential oils diluted to soothe and promote a healthy system. Blends well with rosemary, lavender and tea tree. Dilute peppermint oil in water for aromatherapy or a carrier oil like jojoba, coconut or olive oil for topical use. A few drops in your cleaning liquids and the scent is divine!! Also great for your diffuser!! Repeat order and I love the fresh Peppermint aroma! I use it in the bedroom. Will mix with some other ingredients and hope it helps with my thinning hair. I have been diagnosed with COPD. When I feel my breathing becoming labored, I just take a whiff. I also mix this with my conditioner when I deep condition my hair. It really stimulates the scalp. I use this oil on my hair and the price is good. This is the first time I have tried this brand. I love the clean, fresh scent that diffusing this oil in my home provides! Suppose to be good for coughing. I suffer from allergies and hoping that this might do the trick along with the diffuser I bought. Why should I pay for bug repellant when I can use an natural oil to get rid of pest. Love the peppermint fresh scent in the room. Using with my diffuser. Can you dilute this and drink for pain relief if not how do you get relief for nausea? BEST ANSWER: Thank you for your question. This cannot be consumed. It is essential oils that can be used with an aromatherapy machine. We hope this information will be of help to you. Does peppermint oil really help stomach issues? BEST ANSWER: Thank you for your question. Yes, peppermint is helpful for the stomach. We hope this information will be of help to you.